It seems like there are is always construction going on somewhere in Iowa year round. Working in the construction industry can be very dangerous because there are many hazards that put you at risk for an injury. Did you know that construction jobs rank as the third highest for death caused by an injury? Although there are ordinances, regulations, and industry standards that command employers to provide a reasonably safe work environment, construction workers still suffer serious injuries at an alarming rate. In fact, for every 100,000 workers in the U.S., 15 die due to injury. Why Are There Injuries on Construction Sites? There are many different types of injuries a person could sustain from working at a construction site. Things such as heavy machinery and equipment, heights, loud noises, and holes can be very threatening to workers. Working with such heavy machinery every day can be hard on the equipment itself, making sure everything is in good working order will help prevent injuries that could be caused by normal wear and tear of the equipment used. If you notice a tool or piece of equipment starting to deteriorate it would be very wise to get it fixed right away and not let it completely break on someone. What Types of Injuries Occur on Construction Sites? Common types of injuries in construction sites might include falls, crane accidents, scaffolding accidents, electrical accidents, fires and explosions, and even workers being ran over by equipment. Chances of someone getting ran over by equipment increases when on a highway or busy road. Workers need to be alert and careful at all times when practicing safety, a simple mistake in procedure could result in a dangerous accident that most likely could have been prevented. One of the most common construction site accidents is falling such as roof related falls, holes in flooring, and crane falls. How Can I Protect Myself While Working Construction? Following safety guidelines, every day is the number one thing construction workers can do to protect themselves and their co-workers. If you work in the construction industry it is important that you get plenty of sleep at night, your reflexes will be sharper and your judgment will be clearer than if you only got a couple hours of sleep. It will also help you to be alert when operating equipment. Avoiding drugs and/or alcohol is vital. If you are under the influence at work, it can severely impact your judgment and senses, making you a high risk to yourself and everyone around you at work. Also, if you are injured at work and test positive the chances are high that you will not be compensated for your work injuries. 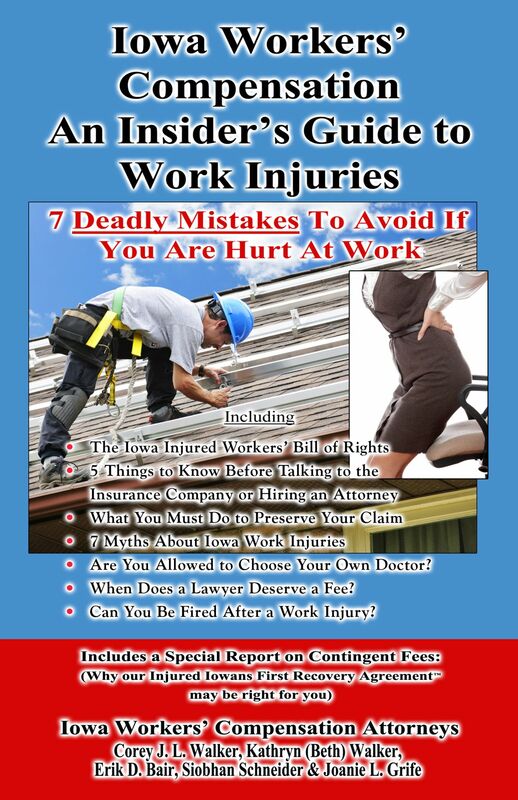 To receive a Free book entitled "Iowa Workers' Compensation- An Insider's Guide to Work Injuries" which describes Iowa work injuries including the "7 Mistakes To Avoid If You Are Hurt At Work" Call Now 1-800-707-2552 (ext. 511) (24 Hour Recorded Message) or log onto www.IowaWorkInjury.com. Iowa attorney Corey J. L. Walker has helped hundreds of injured workers recover compensation for their work injuries and he practices primarily in workers' compensation law. He offers his book for free because he has seen too many Iowans make mistakes which cost them thousands of dollars. Iowans hurt at work are beginning to realize that the insurance company for their employer is not there to help them and that they should learn their rights and responsibilities. Finally, there is a book about Iowa work injuries that you can review in the comfort of your own home with no cost, obligation or risk. For immediate assistance call 515-440-2852 and ask for Corey.